Exped Travel Hammock Plus. 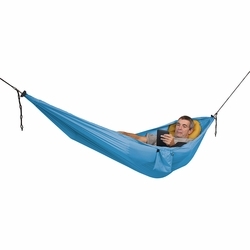 Lightweight, compact, and fully feature hammock for relaxing, travelling, or just hanging out in the woods. Suspension kit with easy to use slit setup cords and two karabiners with drip shields. Durable 4 fold sewing at ends. Can also be used as tarp. The integrated stuff sack doubles as pocket for personal items.